Fur: White, with black-tipped tail. First appearance: "The Pursuit of Happiness"
Lois' history is long and varied. After spending his early life with his family, he was taken for service in the lord's court due to his father's neglect of their farm. This period was only meant to be for a little while, but even the absence of his son could not inspire Lois' father to work, so the young boy ended up spending most of his adolescence in the lord's manor. During this time, Lois discovered a training ground for assassins that the lord was training due to his own paranoia. Lois became intrigued, and spent much of his free time hiding and watching the assassins train. By the time Lois was allowed to return to his family, his father had died, and his mother had to sell their plot of land for lack of any other way to pay for the debts the man had incurred. Lois' mother died the next winter, after fighting through an extended illness. With the only ones he knew dead, Lois left his home in hopes of finding his own way. A long period followed in which Lois was unable to find steady employment, and this drove him to try things he would not have been willing to do otherwise. Somehow, he ended up back where he had been born. A lack of care with his words caused Lois to become a target for a group of assassins, who brought him to their base of operations. The assassins were all members of the secret group Lois had seen earlier in his life, but the lord's group had been disbanded, and many of the men were now assassinating for their own profit. Lois managed to bargain for his life by offering to join their collective endeavor, and began training with the men. At first opportunity, Lois escaped from the assassins, but still could not find work. It was desperation that eventually drove him to use his training to supply his food, and the first assassination led him to believe that this was the life that he would have to lead if he wished to survive. Lois visited Metamor Keep prior to the Curse, hoping that the reputation of the Keep as a center of knowledge would help him learn one of the Southern dialects so that he could move his trade. While he was able to learn a good bit in his time, he eventually lost interest in this pursuit and left Metamor to continue his work. A few years later, Lois made a decision to leave the assassin's trade. For a while he lived off of the money he had gained over his life as an assassin, but later decided that his skills could be put to use if he hunted the lutins, giants, and other creatures that occasionally slipped through Metamor's patrol network. Styling himself a bounty hunter, he tracked down and killed any such creatures that gave the local villages trouble, and made enough of a profit that he was able to live comfortably without opening his savings. In winter 707CR, Lois hired himself as a guard for a caravan bound for Metamor, offering his services in exchange for free passage to the Keep. The caravan was forced to turn back due to inclement weather, but Lois continued on and reached the Keep on his own. Since coming to the Keep, Lois returned to many of the places he once frequented on his first visit to the Keep. Although much had changed, Lois made up his mind to stay and accept the effects of the Curse. The Curse changed him into an ermine. Many of his scars were erased by this change, but the three scars that prominently show across his face are still present, highlighted by black fur in the area. Vincent Lois bears the scars of several years of fighting, the most noticeable being the three scars that run down one side of his face, with their origin at the hairline and the ends just below his eye. The leftmost crosses Lois's eyebrow and misses his eye by less than an inch. The Curse took many of his scars away, but highlighted his facial scars with lines of black fur. Lois is neither very strong nor very quick, but he uses the two in combination with great agility to defeat his enemies. He is not above running from a losing battle, and often uses this as a tactic to turn a battle in his favor. He uses two main combat styles, based on agility and brute force respectively, but often blends the two to create a style matching his opponent. His weapons of choice are his daggers, which he used for his assassination work for years. 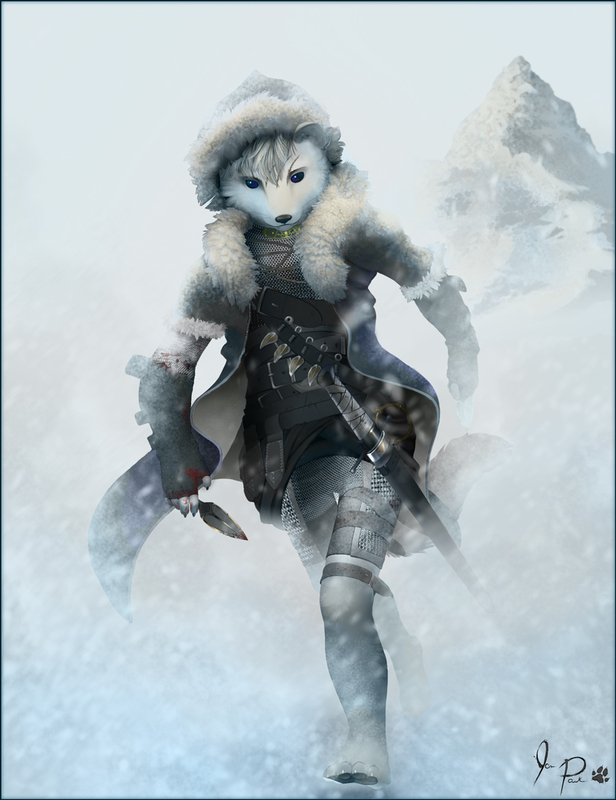 While he possesses skill with other weapons, his combat style is suited most to the daggers. Vincent Lois is extremely apt at manipulating a conversation to go the way he wants using his actions, expressions, and words. He prides himself on being able to outmaneuver most interrogators without them even knowing it. He used this to his maximum advantage while negotiating with potential employers. Lois has also made use of the ability to throw his voice in various situations. While generally used to confuse an opponent, Lois also uses this skill to intimidate people who are not familiar with this skill. Lois lacks any skill with magic. He possesses a good mental understanding of many styles of magic, but has been unable to put any of the skill into practice himself. To compensate for this in battle, Lois uses an amulet to shield himself from elemental magic.